Ever since I found myself listening to and searching out more obscure, weirder, and “critically accepted” music (right around the end of high school for me; I was not one of the cool kids into Death Cab back in the day), I always felt like Radiohead was a band I should love. As one of the most successful and celebrated groups of the last 25 years, they serve as almost a rite of passage for any music enthusiast. Which Radiohead album is the best? Which is your favorite? Which was the most groundbreaking? That’s how the conversation goes among most music critics. As a fan of indie and alt-rock, I’ve gotten into many different bands – some critically praised, others not. So it would make sense for me to really enjoy Radiohead, or at the very least, hold them up as a demigod of indie rock. The problem is that I’ve never understood the endless praise. 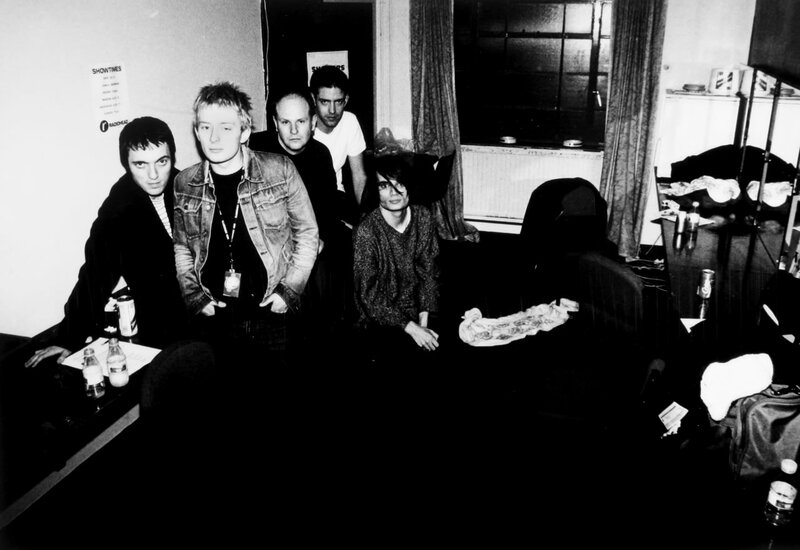 Their two seminal, game-changing albums, OK Computer and Kid A, have never inspired much admiration or even interest to seek out more of their work. I’ve found most of their music chilly, impersonal, and at worst, just plain boring. To sum it up, Radiohead’s music has never moved me in any significant way. When it comes to huge British rock bands of the past 20 years, I actually prefer Coldplay. I get it, Coldplay > Radiohead = Music Fan’s Suicide, but I’ve always been more drawn to the swelling, accessible arena pop-rock of Chris Martin and Co. over Radiohead’s incoherent, art-rock ramblings. Yes, that’s oversimplifying it. Radiohead have proven they can do excellent pop songwriting and Coldplay have proven they can pull off a darker, more challenging sound. My point stands, though: I’ll take Coldplay’s gorgeous, if slightly saccharine, melodies most days. As any fan of theirs will tell you, Radiohead are the better band. But Coldplay became the bigger one, perfecting some of the former’s early sounds. However, perhaps I haven’t given them a fair shake. Maybe I’m just missing something, or maybe I need more exposure to them. With this in mind, I decided to run through every one of their studio albums, listening to them at least twice. Would I come out the other side of this lengthy excursion converted enough to begin worship at the Radiohead Altar? Or would it simply be an exercise in self-fulfilling prophecy? Well, if you want to rip on something as “overrated” or whatever, at least know what you’re talking about, right? I tried to go in with as open a mind as possible and see what I could find. Radiohead supporters seem to pretend that they appeared fully formed out of the ether, pure and untouched by music that came before them. In reality, their influences are both obvious and wide-ranging: U2, Pink Floyd, the Smiths, and R.E.M. are most clearly among them. This isn’t a bad thing; every artist needs predecessors before them to help shape their art. However, acting like Radiohead have always been a paragon of originality is a bit misguided. I mean, their band name comes from the title of a Talking Heads song. 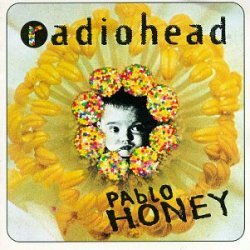 Pablo Honey came out two years after Nirvana’s landscape-shifting, breakthrough debut, Nevermind. This period was fertile ground for these post-punk, alternative artists, but Radiohead only finds their stride on “Creep” here. The rest is one mediocre alt-rock jam after the next; not much to separate them from the pack. It would be The Bends that marked their first album-length success. From the ear-catching opening sounds of “Planet Telex” to the soft, folk-rock of “High and Dry” to the gorgeous “Bulletproof”, The Bends is far and away their most consistent, accessible record. Many songs have that classic 90s-style alt-rock hook to them (which is the last time they would do that), but the album lifts above the fray with its occasional subtly haunting instrumentation. This is more than “Nirvana-lite”, as many have called their early work. It’s a fully realized rock album, one of the best of the decade. Going into this project, I would’ve told you The Bends is my favorite Radiohead album. This wasn’t a ready-made hipster answer to deflect any who think I only listen to their popular stuff; it was just the only album I found truly worthwhile. It can go from quiet and airy [“(Nice Dream)”] straight into loud rockers (“Just”) without losing its larger structure. It can break out the template for future soft rock anthems (“High and Dry”, “Fake Plastic Trees”), while sticking the landing on gloomy and haunting beauties “Bullet Proof” and “Street Spirit”. 1995 was back when they still rocked out in a conventional manner, particularly on “My Iron Lung”, which, although one of the weaker tracks, gives the record some jolting forward motion. All in all, it was a natural progression from straightforward alt-rock to the fussier, artier arrangements they would move on to. Considered one of the greatest rock albums ever, my first experiences with OK Computer were less than impressive. The few times I had listened to it before now had left me writing it off as dreary and sleepy. However, more listens have yielded more rewards. These few times around, I started to see the strains of greatness that everyone has raved about. “Airbag” starts it out well, even if the last couple minutes stray too far into noisy art-rock. 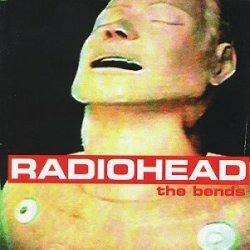 As different an album as it is, “Let Down” and “Karma Police” could conceivably be found on The Bends. 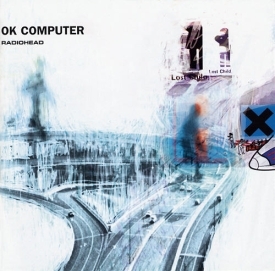 The closest thing to a standout OK Computer has is the latter, which is still one of their most recognizable songs. There are moments that keep me from considering it one of the best albums ever though. “Electioneering” is woefully out of place here, and is an awful start to the second half of the album. Also, I realize it’s a concept album but the interlude “Fitter Happier” does not need to be two minutes long to get its point across. Still, the back half houses the wistful, excellent “No Surprises” and the daunting guitar on “Lucky”, both of which make sure this album gets back on track. The closer, “The Tourist”, is a suitably contemplative ending, with lead singer Thom Yorke pleading with us to “slow down”. The “man vs. machine” rhetoric of OK Computer actually doesn’t get too preachy though, and I’m sure the lyrical content was quite ground-breaking in 1997. While my appreciation has grown for this album, I still find it hard to really get my arms around it. It’s a little too willfully difficult to embrace as a touchstone of modern music making. If I found OK Computer too thorny, then you would think the more experimental, electronic Kid A would have the feel of a cactus. Actually, not entirely. This album probably has the largest variation of hit-or-miss for me. “The National Anthem” has that legendary, straight sinister bass line that will catch any music lover’s attention. “How to Disappear Completely”, on the other hand, is solitary, reflective, and eerie. It’s a pitch-perfect mix of natural and electronic instrumentation that Yorke considers the most beautiful song they’ve ever made. “Optimistic” is another standout. Unfortunately, there are downers on this record that keep it from reaching the heights it could otherwise. Right from the start, you know it’s going to be a different kind of sound, and that sound is mostly electronic with minimal guitar. Now, Radiohead guitarist Jonny Greenwood has one of the best ears for those sweet riffs, but they are fewer and further between on Kid A. “Treefingers” is spare to a fault and the drony, uneventful “Idioteque” doesn’t do the back half of the album any favors. Through all of this up and down, “Motion Picture Soundtrack” is a classy finish that lends a sonically wondrous conclusion to an album that has long been considered a game-changer. In my few previous Kid A listens years ago, I thought that there wasn’t much there to make me want to keep listening. That was harsh, as Kid A harbors plenty of quality musical nuggets that you just have to dig a bit to find. 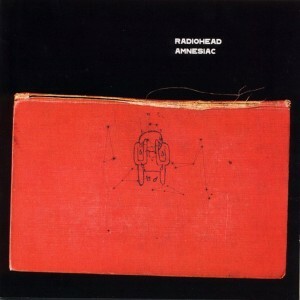 A year later came Amnesiac, which worked as a kind of pseudo-B-side to Kid A. The songs came out of the same recording session, but some fans swear by Amnesiac. It was probably the Radiohead album that was most unknown to me, so I thought maybe I would find something special. What I found was remarkably experimental and erratic, even for Radiohead. The enjoyable and/or captivating parts of the group are there, they’re just extremely spotty on Amnesiac. The second track, “Pyramid Song”, has a strings section that forces you to recognize their ability to surprise with unpredictably pleasant melodies. “Life in a Glasshouse” closes the album with an interesting, jazzy departure from anything they’ve done before. 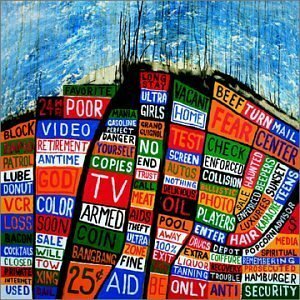 These songs, as well as “Knives Out”, are the undisputed highlights you get out of a collection of Radiohead songs. On the other hand, this is Radiohead in a mode that I can’t fully get behind. The other tracks are experimental and avant-garde to a fault, particularly “Pulk/Pull Revolving Doors” and “Dollars and Cents”. Then there is Thom Yorke’s vocals; which, if I’m being honest, may be at least part of my past issues with the group. His soft, fragile, morose falsetto obviously does it for some people, but I’ve never been in that camp. On Amnesiac, his voice sounds more cracked, almost weaker than ever before. Whatever the reason, it doesn’t draw me in; it pushes me away. Mostly stripped down with hardly any guitars, Amnesiac’s sound is so difficult to grasp onto, even if you enjoy “difficult” music. While it has a few high points, most of Amnesiac unfortunately comes out sounding like what it likely began as: a poor man’s Kid A. Two years later, Hail To The Thief wasn’t a poor man’s Amnesiac, as much as it was its angrier, more paranoid brother. Clearly put off by the United States and United Kingdom’s war on terror, Radiohead set out to make a more obvious political album. Apparently, they recorded it in just two weeks, and unfortunately, I think that shows. Hell, the name of the record sounds like a hastily-thrown-together anti-Bush protest sign in 2003. It’s sonically expansive, sure, but that doesn’t necessarily mean it’s an interesting listen. With hardly any standout tracks, you better hope the overall feeling of the album moves people. For me, this was not the case. The problem could be that I’m starting to figure out that I enjoy guitar-centric Radiohead more than any other version of the band. Guitarists Greenwood and Yorke’s rangy melodies and riffs are my favorite part of Radiohead, and those are too rare on Hail To The Thief. Side note: It’s also amazing how the more you listen to them, the more you realize how ridiculous all the comparisons with Coldplay are. Not because they are heads and shoulders above them, but because post-OK Computer their sounds aren’t even that similar anymore, if they were even all that similar from the start. Anyway, the guitars only get a chance to break out during the spooky, charging “Where I End and You Begin” and album highlight “There, There” (which features the lyric, “Just because you feel it doesn’t mean it’s there”. An early nod to WMDs in Iraq, perhaps?). While overall Hail To The Thief ended up straying away from didacticism (thank goodness), it also missed their intended mark of paranoia-fueled, minimalist sounds of dread and angst, which fall flat more than they pack a convicting punch. About 40 seconds into In Rainbows, an intricate guitar lick comes in and I knew I would enjoy this album more than their last few. Somehow I had never listened to it before, or even heard many of the songs. I was a junior in high school when this one came out and can remember a select group of my classmates losing their minds about it. 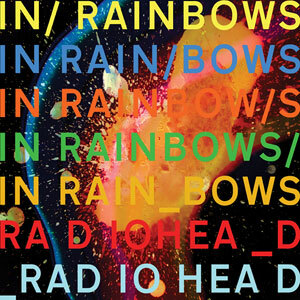 Even though In Rainbows is one of my favorite versions of Radiohead (second, behind The Bends), I wouldn’t say its greatness totally warranted my peers’ reaction back then. “15 Step” and “Bodysnatchers” grab your attention in a positive way, introducing you to a Radiohead that functions as a whole band, and has no qualms about that. Instead of a sound that comes across as Yorke fooling around by himself (as Amnesiac and Hail to the Thief sometimes sounded), this record lets the drums bang and guitars rip loose. There is still the classic indie restraint, however. “Faust Arp” is a straightforward strings and acoustic number that shows off Radiohead’s “pretty” side. Piano-heavy pseudo-ballad “Videotape” is a worthy, if almost sentimental, way to conclude the album. It’s an emotional finish that ends this occasionally epic trip with a timely whimper, instead of a bang. The negatives on In Rainbows are much harder to find. The sleepy “House of Cards” is overlong, but still more bearable than their weaker tracks on other records. Many of these songs start quiet and have a gradual build about them – something I’m always a sucker for. Album standout “Reckoner” doesn’t do much of this, but it does sit perfectly as the mid-album stunner. The foreboding, melancholy guitar-drums combination moved me like almost no other track of theirs ever has. Pitchfork put it well in their review when they remarked that Radiohead had “embrace(d) their capacity for uncomplicated beauty”. I would absolutely agree. This is a Radiohead that is less fussy and more accessible than they have been since The Bends, and it had to be a nice break from the experimental side for even their most ardent fans. You’re not supposed to judge a book by its cover, but the album cover to The King of Limbs gave me the impression that it would not be my favorite. The drugged-out aesthetic had turned me off before I got started, but album opener “Bloom” kept me intrigued. It’s a scattered, moody, atmospheric track that doesn’t announce too easily what the rest of the album will sound like. 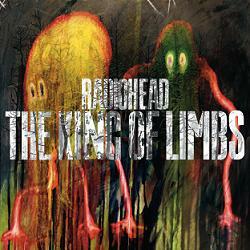 While they can usually always be described as all three of those, the members of Radiohead went for a spaced-out and unpredictable style on The King of Limbs. Half of me wanted to nap to it, and the other half wanted to sort out its greater mysteries. The next few songs after “Bloom” don’t exactly have you pining for repeat listens. “Little By Little” and “Feral” have an interesting, uneven percussion, but never really take off into something better. The crazy time signature shifts continue into the more normal-sounding “Lotus Flower” and the drowsy, piano-driven “Codex”. “Give Up the Ghost” and “Separator” closes out The King of Limbs without much fanfare, but when have these guys ever been known to revel in that? 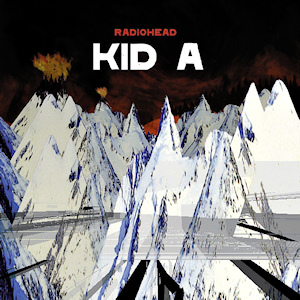 This album is actually the rare case where the back half may be better than the front, which is a comparison Radiohead almost seem to welcome considering the first four songs are significantly more jagged than the smoother final four. Still, most fans have seen this as a disappointment following the success of In Rainbows. It’s not hard to see why when this effort comes in at 37 minutes, a length that resides ambiguously between an EP and an LP. This could actually be the one album when it makes sense to compare them to Coldplay, whose most recent record, Ghost Stories, was a 40ish-minute downer that was devoid of much excitement. Both of these albums just seem like “minor” records in the grand scheme. This is probably because Radiohead have tired of the rigors of the album-making process, which they have commented on in the past. The King of Limbs seems almost like a halfway effort that gave the fans more music, but didn’t even attempt to reach the heights of previous triumphs. Several hours of listening and almost 2,800 words later, what have I learned about my view of Radiohead? In true copout fashion, I would say it’s still evolving. Hear me out, though. Many of my previous hangups with them were confirmed. Throughout much of their discography, I encountered the chilly and impersonal sound I had always expected. Some of it may be well-made and even beautiful, but that alone doesn’t give me a connection to it. Many have compared their music to the films of the great director Stanley Kubrick. In 2001: A Space Odyssey, A Clockwork Orange, The Shining, and others, he introduced American audiences to cold, calculated, and gorgeous cinema. He was considered a master, even if some accused his films as emotionless, and thus, lifeless. They may have a chilly atmosphere to them, but those movies have plenty of life in them. Something more than their external beauty draws me in. Unfortunately, I can’t say the same about Radiohead. After this eight-album trip, I still find it almost impossible to completely love and adore their music. Certain areas it’s too knotty, others it’s too placid, and not much about it transcends time and space like it does for so many of their fans. That doesn’t mean I haven’t come upon newfound appreciation. My respect for OK Computer has grown rapidly, and although they certainly have albums I don’t care much for, I was able to find individual gems among Amnesiac, Hail to the Thief, and The King of Limbs. Finally, In Rainbows is a new record that I will be spinning several more times to get a good feel for. So, are they my new favorite band? Um, no. Do I still think they are the most overrated band of the past 25 years? Absolutely not. Radiohead – despite being a group my personal tastes don’t fully mesh with – have inspired countless artists that I enjoy today. If anything, I have to appreciate that. Regardless of your decision, you run a great blog here and I’ll be sure to look out for more of your film pieces.